when i first saw the top, i was really depressed. the top looked so small. how on earth am i gg to fit it in. LOL. the first thing in my mind is, can i email SMooch to exchange sizes. HAHAHAH. but in the end, i am glad that it fits me. i am not sure if anyone knows. 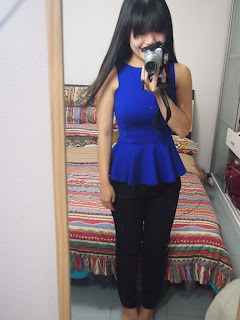 when i first saw the preview on SMooch website, it highly resembles the CWC iris peplum top i have. and when i received it, i realised, its exactly the same. LOL. from the cutting, design and material used. just that my cwc top is not as fitting as the SMooch piece, cause they are both in different sizes. CWC version is self manufactured. whereas SMooch is not. CWC Iris Peplum top in Crimson, Size M. ------ > i am letting this go. let me know if anyone is interested. definitely prefer the most fitting SMooch pc! HAHA. Sizing: as mentioned, this top is more fitting than my previous crimson pc. so hooray to a more flattering top to own! 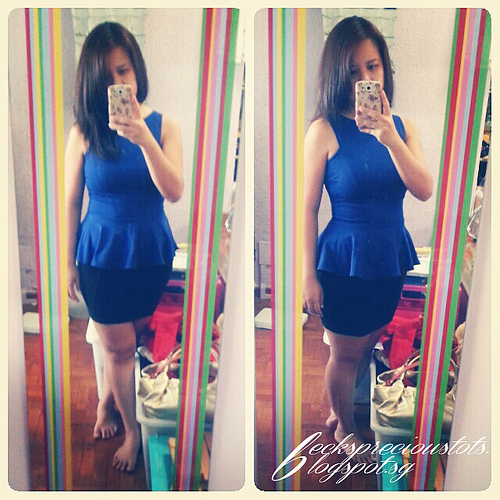 everyone should buy this peplum top! else you can buy from me if you want a huat red colour for upcoming CNY. HAHAHA.